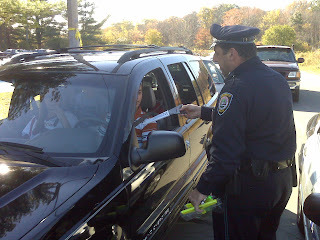 Burlington Safety Officer Bernie Schipelliti was kind enough to spend 45 minutes at the end of school checking that all of our student drivers and their passengers were buckled up as they left school today. Officer Schipelliti also presented each driver with a gift as he thanked them for remembering to buckle up. As always, the Burlington Police showed their high level of proactivity when it comes to keeping our students safe. Kyle and his passenger were buckled up safely!